Curvy . : Sequins and Sand Resort Wear :. The envy of all women. A curvy hourglass shape means you have a magnificently defined waist with shoulders and hips of equal width. Relax, you can wear just about anything! The most important thing is not to lose that shape in what you wear with overly full and baggy styles. Swimwear should get your bust out and up and define that gorgeous waist. Crossover styles are perfect for that. A straight across the bust bandeau style will also accentuate your shoulders and keep your hips in balance. A one shoulder style will do the same. With a fuller bust, a 'V' or Sweetheart neckline or low scoop is your best friend. A little ruching across the torso is fine, but not too much, we want to show off that waist remember?! The same for summer kaftans, dresses and tops. Look for styles cut on the bias or that you can belt in to define your waist. A simple shift will do the trick particularly if it has darts in the back to bring you in a little. Look: Black & White - It's Alright! 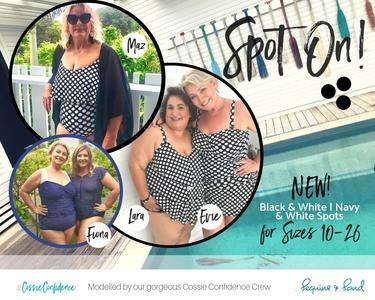 Finding THAT swimsuit that's best for your shape can be difficult and very frustrating. And for many women, it’s a very confronting and emotional journey. This is a guide to finding yours for your shape. Curvy Swimwear. The name says it all. Made for curves and built for comfort without a thread of frump in sight. Gloriously soft and styled with a generous dose of 'I am woman'. A Crossover One Piece swimsuit is a fabulous all-rounder. A very clever swimwear. An eternal classic for a very good reason. Think crossover dress and you start to get the idea.